Why did we have to go to Shriners? Our daughter was diagnosed with Developmental Dysplasia of the Hip (DDH) on her third day of life outside the womb. The first pediatrician that examined her did not notice the clicking in her right hip. The following day, Dr. G, who has since become her regular pediatrician, performed an exam and noticed the clicking. He is always careful in his checks for DDH as his nurse had two daughters with DDH, one that wasn't caught early enough and had to have surgery. An ultrasound confirmed the diagnosis. Developmental Dysplasia of the Hip (DDH) is a defect in the joint of the hip that can occur before, during or after a baby is born. The hip is a ball-and-socket joint; the rounded section of the thighbone, or femoral head, rests in the cup-like hipbone socket also known as the acetabulum. In some cases of DDH the thighbone moves within the socket, causing an unstable hip. In more serious cases, the femoral head becomes dislocated and moves completely out of the socket. In other cases, the femoral head may not reach the socket. It's easiest to look at it as something that just happened, but I’d like to blame it on a rough labor so I don’t have to worry about it happening to another baby of ours. It's more likely that we'll have another baby with hip dysplasia now that we've had one. On our daughter's fifth day, we went to Shriners Hospital for Children and she was fitted with a Pavlik Harness. She wore her "harnie" for 24 hours a day for the first 6 weeks of her life. It broke my heart. We did so much skin-to-skin in the hospital and I missed it so much. I couldn't snuggle my baby, I couldn't touch her soft skin, I couldn't give her a bath at home. Of course, I fell apart emotionally when they put the harness on her. Recovering from a c-section and surging with mama hormones didn’t help a bit. We had to go to Shriners once a week for her bath and check to adjust her harness. We also had frequent ultrasounds during this time. When are really young, their bones aren’t calcified enough for x-ray so ultrasounds are required as a diagnostic tool. At the same time, Mr. Making It Bright was having emergency bowel surgery and recovering. Talk about a mess of appointments! 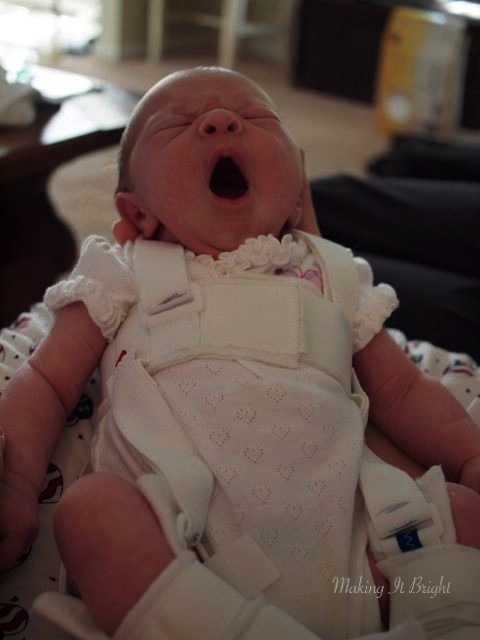 Luckily, our daughter was so young when she got the harness that she didn't know anything different. See Our Shriners Journey Part 2, Part 3, Part 4, Part 5. Kandace, this is so interesting (for a pediatrician in training). I test for "hip clicks and clunks" almost everyday. I'll keep your story in mind. :-) So glad it was caught early!